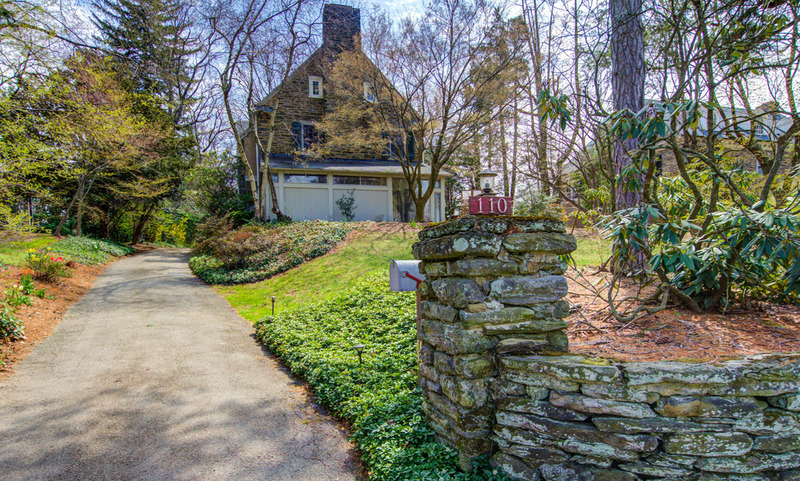 Walk-to-everything in Chestnut Hill from this quintessential center hall Pennsylvania stone colonial set back on a quiet, tree-lined street. Generously sized rooms are showcased by the original interior details such as deep windowsills, gleaming hardwood floors, arched doorways, crown moldings and wainscoting. The entrance foyer with coat closet and powder room leads to a large center hall with French doors to the side terrace. To the right of the center hall is the spacious living room with wood-burning fireplace, tons of windows and natural light, and plenty of built-in shelving. Step through to the 3-season sunroom with brick floors, large fireplace, sliding doors to the terrace and walls of windows overlooking the side yard and plantings. To the left of the center hall is the large dining room with fireplace, gorgeous bay window and French doors to the rear gardens. The kitchen features a large center island with Bosch range, custom cabinetry, sunlit breakfast area with ample built-ins, rear staircase, 2 oversized walk-in pantries and mud room with storage and access to the driveway. Upstairs, the large master suite offers beautiful hardwood floors and full updated bath with original subway tile, separate tub and walk-in shower. Two full hall baths, one with a large clawfoot tub, laundry room and 3 additional good-sized bedrooms with ample closets complete this floor. The third floor has a large landing, two large bedrooms and a full hall bath. Sit on the peaceful side terrace and enjoy the beautiful mature plants that surround 110 W Moreland Ave, or entertain in the backyard under the trees and listen to the Summer Concert Series at Pastorius Park. Conveniently located just a block from the shops and restaurants of Chestnut Hill, two blocks from the St Martins train station, and just 20 minutes to Center City Philadelphia, making for an easy commute downtown. Don’t miss this gem! Just steps from the Avenue, train station and everything Chestnut Hill has to offer!